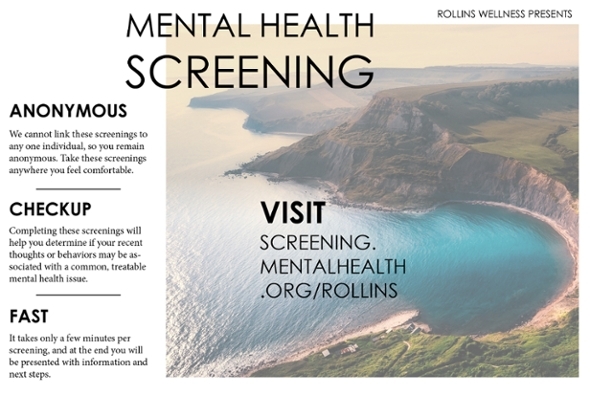 All currently enrolled students, except those in the Master of Arts in Counseling program, are eligible to receive counseling at the Rollins Wellness Center. This infographic will help you in case of a physical or mental health emergency. Visit the anonymous mental health screening home page for links to screenings for common mental health concerns, details about confidentiality, and more information on the screening process. CAPS (Counseling and Psychological Services) at the Wellness Center offers confidential individual and group counseling to students covering a variety of issues that may interfere with academic progress and holistic wellness. CAPS provides crisis intervention on an as-needed basis, as well as outreach, consultation, and referral services. Services are confidential and free of charge to all currently enrolled students except those in the Master of Arts in Counseling Program. To avoid dual relationships that may interfere with the counseling process, Master of Arts in Counseling students are encouraged to look at counseling resources off-campus and to check in with their faculty advisor for additional information on counseling options. CAPS is a clinical training site for practicum and internship students enrolled in a graduate counseling program. Practicum and internship students are supervised throughout their clinical experience and have a particular interest in working with college students. The Wellness Center is offering a new service where all Rollins students can access after-hours crisis counseling by phone by contacting the toll-free number 833-848-1761. This service is available anytime the Wellness Center is closed (weekdays after 5 PM and on the weekends). Please call this number when you are in crisis and feeling overwhelmed. You will be directed to a licensed counselor who will provide in-the-moment crisis counseling and offer local and campus resources to help you with mental health needs. If you are in need of a CAPS counseling appointment during office hours, please contact the Wellness Center at 407-623-6340 to schedule a counseling session. Other programming is available on request. The Wellness Center has partnered with Screenings for Mental Health to offer anonymous, confidential mental health screenings. Visit the anonymous mental health screening home page for links to screenings for common mental health concerns, details about confidentiality, and more information on the screening process. This service is for your own personal use, to see if you might benefit from talking to a mental health professional. It does not diagnose mental illness, but it can offer general resources and recommendations based on your thoughts, feelings, and behaviors. If you would like to discuss your screening results or any other mental health concerns confidentially, please call the Wellness Center at 407-628-6340 to make an appointment with a counselor. Wellness Center groups and workshops promote emotional, social, and creative wellness. Group facilitators provide structure and create a safe environment for sharing, collaboration, growth, and healing. We are currently developing the group and workshop schedule for Fall 2017 based on student interest and availability. Below is a list of potential groups and workshops for Fall 2017. Come visit with Dantéa the Boston Terrier, our Certified Therapy Dog! A chance to implement artistic techniques as a means to express and care for yourself. Learn something new about yourself and the people you love! Share empowerment in recovery from eating disorders and body image concerns. Integrate stress reduction into everyday life and cultivate mind-body wellness. A confidential group for survivors of sexual assault and sexual misconduct. Build trusting relationships and work through reservations and concerns in your social life. Share ideas and build relationships to take your student leadership to the next level. An action-oriented, effective way to manage symptoms and enjoy life. Build a foundation, at your own pace, for changes in your use of drugs and alcohol. Non-abstinence-based, nonreligious, and nonjudgmental. Get empowered to make and maintain positive changes in your use of drugs and alcohol. Non-abstinence-based, nonreligious, and nonjudgmental. A nonreligious, non-step-based, nonjudgmental group for people at any point in the process of changing their use of drugs and alcohol. Gain knowledge and skills for health and safety in situations involving alcohol. A space for growth and healing for students whose parents or caregivers have had addictions of any kind. If you are worried about a friend who may need help, or if you are a parent worried about your child who is a student at Rollins, we will consult with you on how you might support your friend or family member, and, if necessary or advisable, how to try to make a referral to our office or another provider. The rules of confidentiality will apply. Suggest that the student take a look at our Web site for information. If the student is hesitant, offer to make the call with the student to set up an appointment. The student will be required to agree to the appointment and provide contact information to our front desk staff. Offer to walk in with the student at the time of his or her appointment. If you have ever benefited from talking with a counselor and are comfortable with such self-disclosure, share your experience with the student. It may also be helpful to provide the student with the CAPS contact number (407-628-6340) and let them know that we are located in the Rollins Wellness Center at 118 W. Fairbanks Avenue. Suggest that the student accompany you to our office - no appointment is necessary for a mental health emergency. Follow up with the student and suggest alternative treatment in the community if they are reluctant to seek services at CAPS. A list of community resources can be found on our local care provider page. Call to consult with one of our counselors at 407-628-6340 or visit us at 118 W. Fairbanks Avenue. Students may prefer to seek counseling services off–campus or require services outside the scope of what we offer at CAPS. We can provide you with more information regarding your options and assist you in finding a provider who accepts your health insurance plan. If you would like assistance with a referral to an outside mental health provider, agency, or treatment program, please call our office at 407-628-6340 to schedule a consultation appointment with a counselor. In case of a mental health emergency, call 911, After-Hours Crisis Phone (833-848-1761), or Lifeline of Central Florida (407-425-2624). 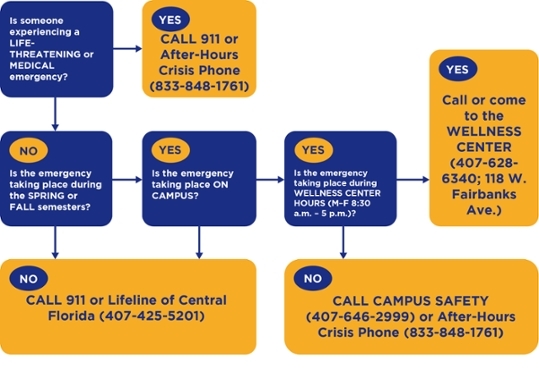 For mental health emergencies on-campus during Spring and Fall semesters, call or come to the Wellness Center (407-628-6340; 118 W. Fairbanks Ave.) during our regular hours; after hours, call Campus Safety (407-646-2999) or After-Hours Crisis Phone (833-848-1761) to be connected to a counselor.